Zine Eddine Djeffa : Post doctoral student (supervisors: A. Ourir and A. Maurel) in the Insitut Langevin, Paris, starting Sept. 2012. Working on experiments in metamaterials in EM. Funded by ANR/Conicyt ProCoMedia project. Aurélien Merkel : Post doctoral student (supervisors: F. Lund & N. Mujica) in the Universidad de Chile, 2011/2012. Working on therory and experiments on non linear aspects of the interaction wave/ dislocation. Funded by ANR/Conicyt ProCoMedia project 2011/2012. Now back in France (LAUM-Le Mans) for a post doctoral position. 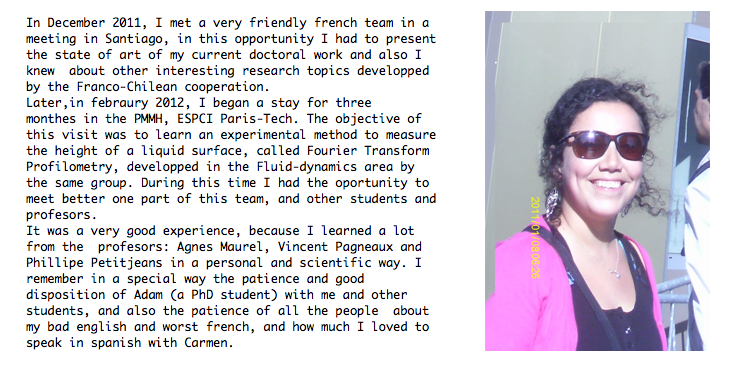 Carmen Palacios : Erasmus program student in PMMH, Paris (supervisors: A. Maurel, V. Pagneux & P. Petitjeans) 2012. Working on experiments in water waves (metamaterials). 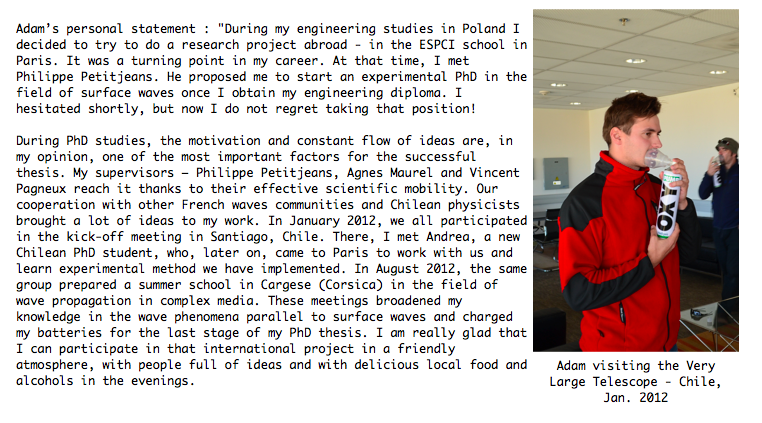 Adam Przadka : PhD student (supervisors A. Maurel, V. Pagneux & P. Petitjeans), thesis ending in Sept. 2012. Working on experiments in water waves.